The future of x-ray technology is digital radiographic imaging. 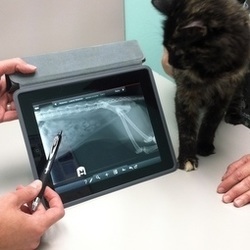 We are proud to offer state-of-the-art equipment for the best possible images of your pet's bones and organs. Digital technology provides improved image quality over traditional film plates, reduces the amount of radiation exposure and makes it easy to send images to specialists when a consult is needed for best interpretation. We can perform basic screening studies as well as advanced radiographic contrast procedures.​ We can even e-mail you a copy of your pet's images when we're done!